The original images were generated based on facebook friendship data as well as data on scientific collaborations from Elsevier’s Scopus. 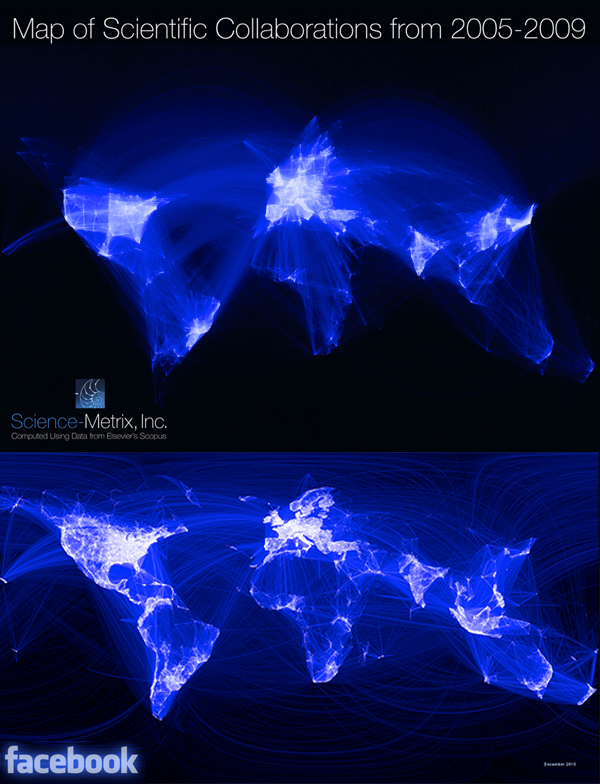 The map of scientific collaborations was in itself inspired by the facebook map – I considered a direct comparison to be interesting. Note that – as far as we know – most brain regions (particularly in early sensory areas) exhibit a connectivity pattern that is quite similar: Mostly local connectivity with some long range connections. In this sense, the external social network seems to replicate the internal one. The image speaks for itself. Neither is a strict subset of the other, with interesting systematic differences. The scientific one basically seems to be a mapping between “global cities“. Update: Flight paths seem to exhibit similar patterns as well. Very great post. I just stumbled upon your blog and wanted to say that I’ve really loved browsing your blog posts. After all I will be subscribing for your feed and I am hoping you write again soon!